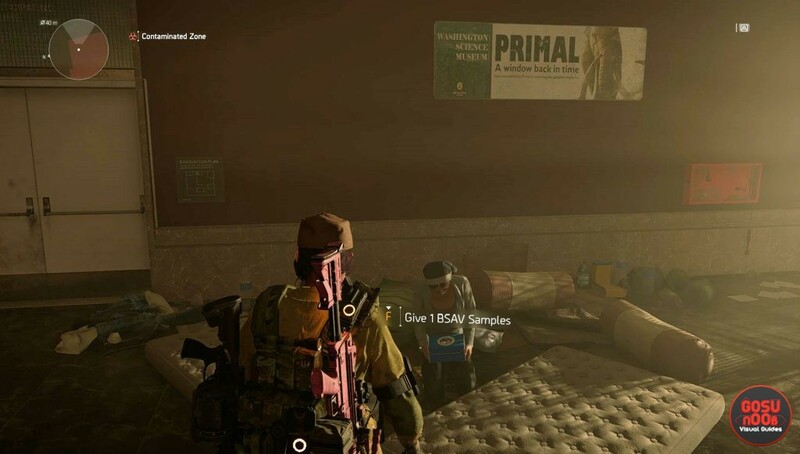 BSAV samples are an item in The Division 2. They first appeared in the Tidal Basin update, and a lot of people got them during the new stronghold mission. The description mentions reports of an infected community in a contaminated area in the East Mall that could use them. Lots of players are wondering what to do with these, which is why we’ve written this Division 2 BSAV samples guide. Once you’ve obtained the samples, you’ll probably start wondering how to use them. There’s an NPC that’ll take them off your hands, but she’s hidden. In order to find her, you’ll have to go to the contaminated area in the north of East Mall. Once inside, make your way to the room with the exhibit. Go to the giant crocodile display, the one across the hall from the staircase, and turn right. You’ll see a door with a sign that says “museum storage: staff only”. Go through there and you’ll find a nun sitting on a dirty mattress on the floor. Talk to her, and she’ll take the samples off your hands. After you leave, she’ll move to the ground level of the Theatre settlement. If you go there, you’ll find her treating a patient. It appears she’s going to accept even more BSAV samples later on, but for now, the option will be locked. While you’re in the contaminated area, there’s a secret loot room you could visit. Every display has a terminal which you can interact with. Doing so will light up the display. When you do this with all five, a key will appear near the crocodile. Take it and go towards the restrooms, behind the rhinos. Open the door and follow the path to the loot crate. It probably won’t be much, but every little bit helps.